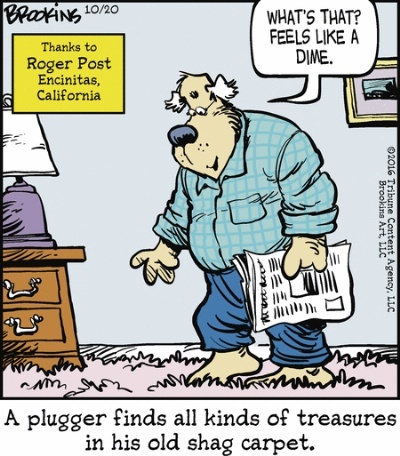 For today, let me go with a strip I’ve never used before, Pluggers, about folks who just plug along. The suggestions come from readers, and those suggestions are then drawn up by the writer. Of course, one has to be barefoot for this to work. Just like last week, I’m going to pull out another summertime Red and Rover. This one is from August 19 from 2016. Aside from the summertime contentment, it also illustrates the ways that toes have a way of being useful that shoes just cannot capture. As I’ve said before, Red and Rover is my go-to strip. This one is from June 27, 2016. Things really couldn’t be more idyllic. My Facebook feed has been full of stories about the Canadian couple who acquired hookworm, or as the story stresses, larva migrans, while vacationing in the Dominican Republic. Of course, many of the stories tell you that the solution for this is that you should always wears shoes on the beach. For today, there’s a lot of this kind of cartoon running around lately. It’s from Rhymes with Orange by Hilary Price and appeared on September 4, 2017. The joke does get old after a while.